Christmas season, the opportunity to Sa Pa (Lao Cai) you should not miss the opportunity to attend Christmas in the church in the heart of this mountain. 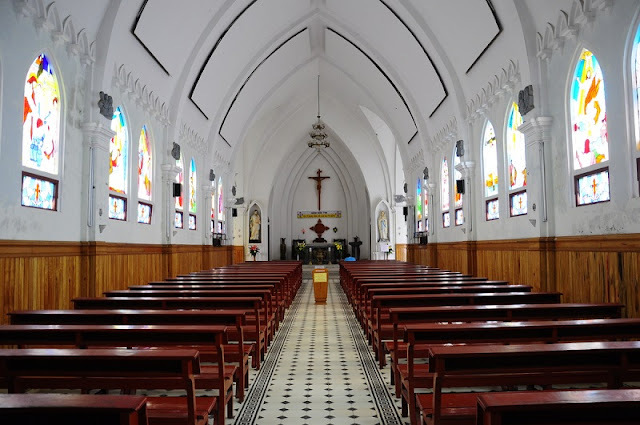 Does not seem to bustling, such as in Hanoi, Ho Chi Minh City, Ninh Binh; Sa Pa church (built in 1895, more than 500m2), Christmas Eve and bold color of the highlands, with cold bones and scattering the horn of the Mong people. The stone church is located in the center of Sa Pa town, Lao Cai province, was built by the French in 1931, to 1942 was completed. The church as a symbol of Sa Pa countryside year fog, where soaking into the breath of the Northwest forest mountains that any visitors to Sa Pa to want to save the image as a word Commitment not yet photographed this church is not yet Sa Pa. The town is colder in the Christmas season, the serpentine long ridges sink deep in the sea of clouds, misty space. 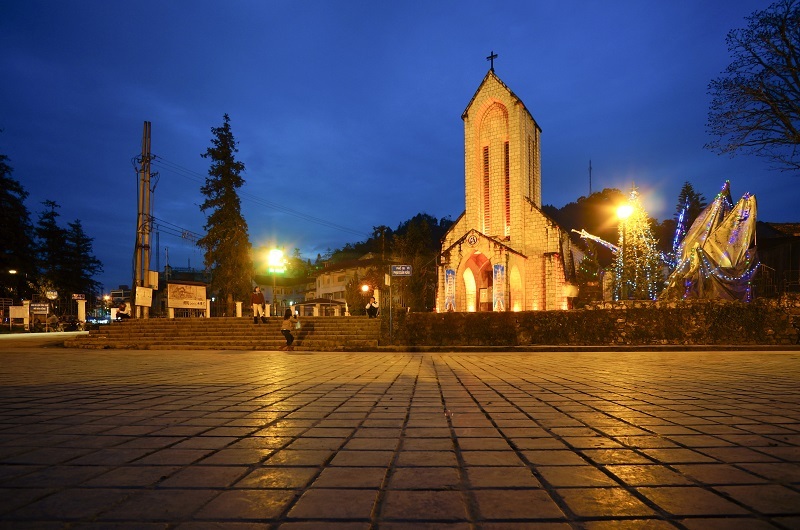 Sapa's church wraps itself on a timepiece, which does not hide the loneliness of thought, even though it is surrounded by curly banners and sparkling lights. Local salespeople shrugged their shoulders, crept up on small streets, and offerings seemed less than everyday. At the corner of the parish church there are early arrivals. Ethnic people dressed in black indigo, feet on plastic sandals and wrapped in leggings, men's boys wear around the belly of long ropes, women and girls are dressed in shawl. It is difficult to distinguish among the H'mong and Dao groups who are standing around the front yard and on the church square, who are lay people, who are not religious. Not Noisy and full of faith, the people walk through the wooden door of the church. Inside, the light was just enough to clearly see the silent prayer seats, the afternoon light on the multi-colored glass on the window. Slowly the religious people were kneeling and hands making holy signs, respectfully praying, praying quietly, melodious and melodious. Behind the church there is a large stage, where soon the priest will lead the followers of the mountain of Sapa to pray and bless the followers. The scene in which "Christ was born in the manger" was reproduced right next to it, around which tourists and lay people stood together. Sacred Christmas music resounded from the speaker hanging from the tree. Christmas welcome in Sa Pa is really a memorable experience, if any chance, do not miss it. 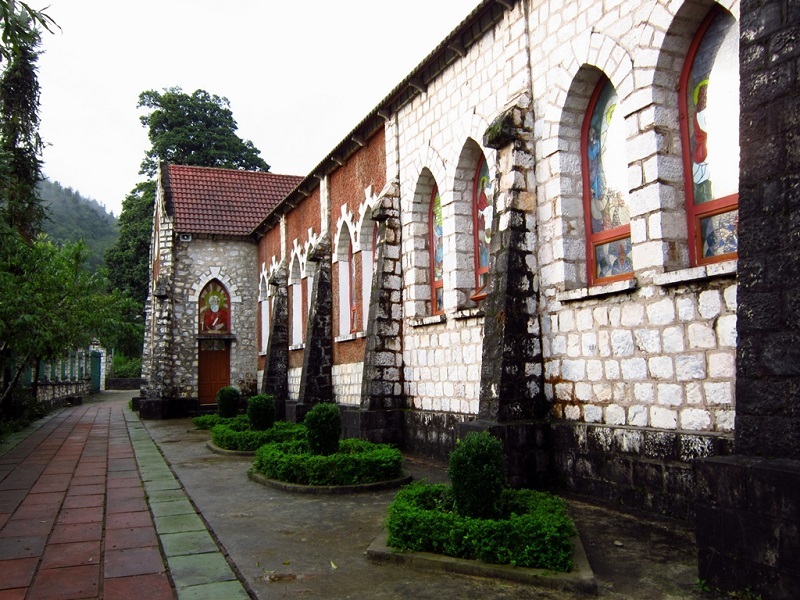 With the splendor of the Sapa stone church and the electric lights bring warmth you will have a peaceful Christmas with the people of the parish Church Sapa stone to bring you on Christmas Eve.